Home / SkinCare / Scienea. Natural Anti-Ageing Skincare. Scienea is a effective, deeply penetrating natural anti-ageing skincare of pure essential oils, super berries and fruit - specifically formulated with clinically proven, natural ingredients to help reduce the signs of ageing. Amphora Aromatics – aromatherapy’s best kept secret - has launched Scienea, a facial serum brand, featuring clinically proven natural ingredients to help reduce signs of ageing, the new Scienea range of two facial serums – ‘Superberry’ and ‘Superfruit’ – is rich in vitamins and anti-oxidants and formulated with pure essential oils, super fruits and berries for all skin types. Superfood for your skin, the Scienea range is formulated with clinically proved natural ingredients to help reduce wrinkles and ‘crow’s feet’ as well as boost skin elasticity and remodel facial contours. Each paraben-free serum contains more than 20, independently tested, natural ingredients. The anti-ageing creators spent two years researching and developing these 100% natural, deeply penetrating facial serums to address specific skincare concerns - from boosting skin elasticity and texture through to helping reduce wrinkles and ‘crow’s feet’ – leaving skin feeling radiant and hydrated. Each of their hard-working treatments contains clinically proven ingredients to really make a visible difference to skin and help restore a youthful complexion, naturally. 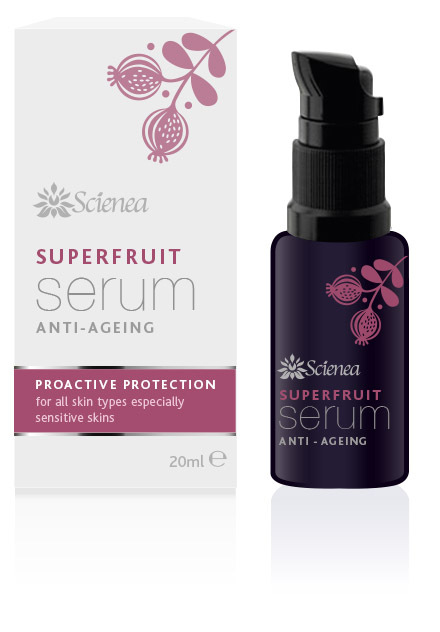 Scienea’s Superfruit anti-ageing serum is made from 100% natural ingredients. Containing a rapid, effective, clinically proven* and wrinkle smoothing natural active ingredient, Gatuline In-Tense, the serum acts on the skin’s lifting properties – giving skin a natural ‘lift’ and enhancing skin density and firmness. Scienea’s Superfruit starts working from the first application and the skin’s wrinkle surface may be reduced by 52% after the first application. Results are even clearer after 28 days of treatment, if used twice a day. Marula Oil, Pomegrante Oil, Apricot Oil, Squalene, Rosehip Oil, Sunflower, Flax Seed Oil, Gold Of Pleasure Oil, Rasberry Oil, Pumpkin Oil,Borage Oil, , Strawberry Oil, Acai Berry Seed Oil, Prickly Pear Oil, Spilanthes extract, Green Rooibos, Black tea extract, White Tea Extract, Rose Oil, Fennel Oil, Lemon Myrtle Oil, Palmarosa Oil. 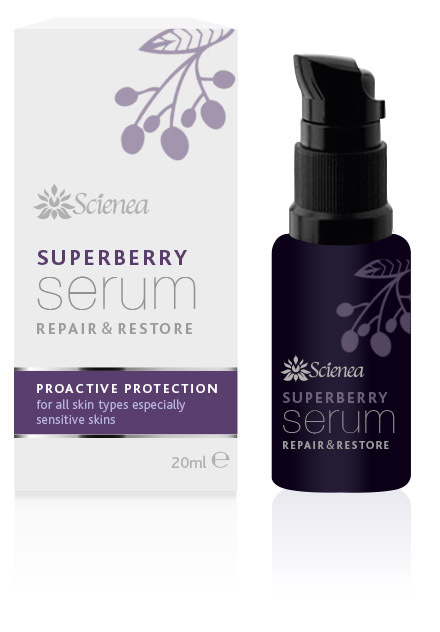 Scienea’s Superberry anti-ageing serum is made from 100% natural ingredients. Penetrating deeply to boost the natural defences of skin, this anti-inflammatory formula contains a natural active ingredient, Collageneer, clinically proven** to improve skin elasticity and firmness. With regular use, the natural ingredients in Scienea’s Superberry can help increase elastic recovery and skin elasticity after 89 days use and lead to a decrease in volume of jowels (loose skin under jaw) after 42 days application. Euterpe Oleracea (Acai)Fruit Oil, Squalene, Andansonia Digitata (Baobab) Seed Oil, Rubus Fruticosus (Blackberry) Fruit Extract, Simmondsia Chinensis (Jojoba) Seed Oil , Shea Butter Ethyl Esters, Oenothera biennis (Evening Primrose) Oil, Helianthus Annus (Sunflower) Seed Oil, Vaccinium Macrocarpon (Cranberry) Seed Oil, Prunus Avium (Cherry) Seed Oil, Argania Spinosa (Argan) Kernel Oil, Lupinus Albus (Lupin) Seed Extract. 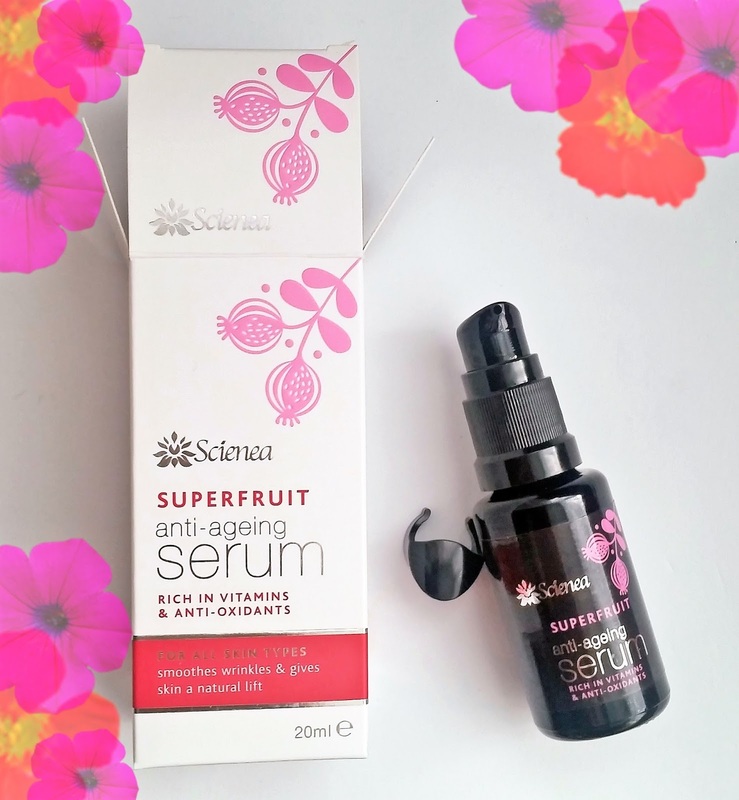 I was sent the SuperFruit anti-ageing serum and was pleasantly surprised by the packaging and the serum itself. The box (which has a beautiful pattern on the inside of it) features clear non-complicated instructions, as well as detailing ingredients, active ingredients, and how it works. The rich in vitamins and anti-oxidants serum resides in a luxury black bottle, setting itself apart from any other serums in your collection. Applying to fingertips, the serum does have a runny consistency so be careful when dispensing. Gliding over skin with ease whilst massaging the oil with circular movements, your skin is instantly moisturised and cared for with a healthier appealing glow. Waiting around 5 minutes before applying a moisturiser gives you time to adore the luxury natural scent that can be detected each time the serum is used. Skin is left perfectly moisturised without feeling greasy and you can then apply your favourite moisturiser followed by your sunscreen. 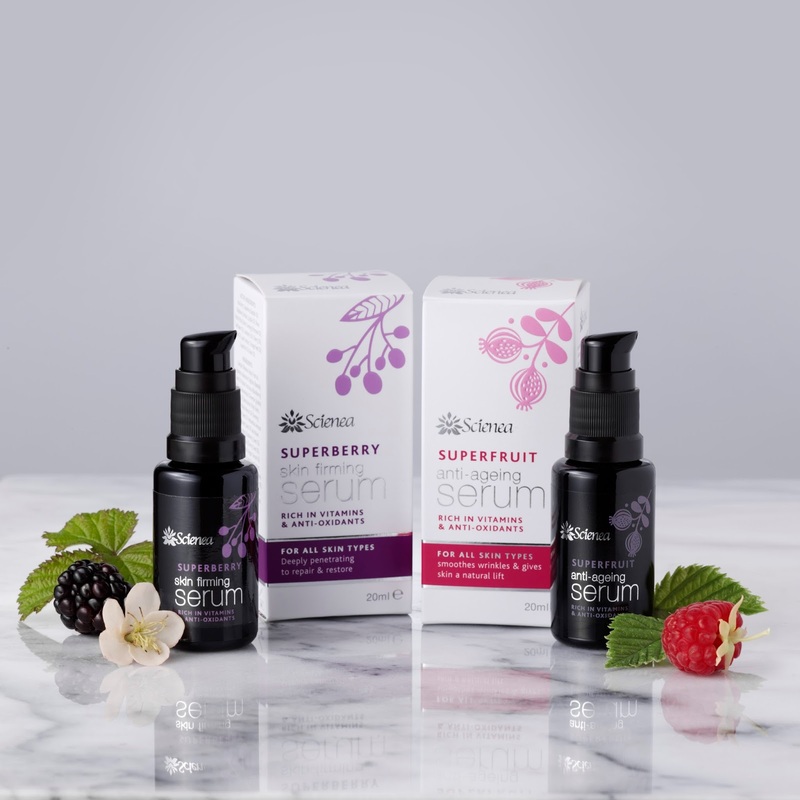 The SuperFruit anti-ageing serum is easy to add into your existing skincare regime and can really boost your anti-ageing efforts when used in conjunction with other anti-ageing products. Each serum retails at £30 for 20ml, find the natural anti-ageing skincare at Scienea. X Neil.